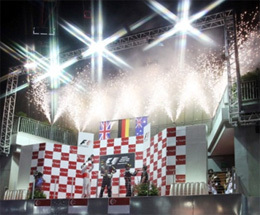 Singapore, 25 September 2011 – One point is all that separates Sebastian Vettel from his second successive Drivers' World Championship after the 24-year-old German and his Red Bull Racing team claimed their first victory on Singapore's Marina Bay Street Circuit on Sunday. "Perfect day in the office!" beamed Vettel after his ninth victory of the season and the 19th of his Formula One career, but Jenson Button postponed the title celebrations for at least one more race by finishing a strong second for McLaren. Vettel now has 309 points to Button's 185, a lead of 124 – when he needs 125 to put the issue beyond doubt. "To us today the title didn't really matter," insisted Vettel. "Our target was to win. I really love the track, I love the challenge, it's the longest race… We were in a comfortable position for most of the race. For the championship it looks like we have another chance at the next race." Third place for Mark Webber means Red Bull also take another big step towards a second double success, opening up a 138-point lead over nearest challengers McLaren Mercedes, for whom Lewis Hamilton finished fifth after an eventful race of his own. Fernando Alonso, twice a winner in Singapore, had no answer for the Red Bulls' pace and finished fourth, ensuring that the sport's current 'Big Five' drivers occupied the top five finishing positions. Vettel had to react quickly in pit lane as he and Heikki Kovalainen's Lotus almost came together after their second tyre stops, but the only time the leader looked less than in total command was in the final five laps, when the leaders were on Pirelli's quicker Supersoft option tyre and Button reduced the gap to under four seconds. Late-race traffic, especially a full lap spent behind Kamui Kobayashi's slower Sauber, cost Button any chance of catching Vettel, a task he admitted would have been beyond him anyway. "In the last stint I was able to drive as fast as I could – it was like 10, 12 qualifying laps, I couldn't have gone any faster," Button said after his first appearance on a Singapore podium. "It was the best we could have done today, I feel that I got everything out of the car." Webber once more fell victim to his start-line gremlins, losing second spot on the grid before the first corner as both Button and Alonso swept through, then having to fight his way past the Ferrari driver in another of the spectacular duels that have been a feature of their 2011 season. "They're enjoyable but I'm not keen to sign up for them all the time because it means I'm with him when I probably shouldn't be," Webber admitted. "Again, it was a difficult start for me – we need to work on this because it makes my race more difficult. Ultimately we pretty much got what we deserved today." The stewards of the meeting decided Hamilton deserved a drive-through penalty for a 13th-lap collision with Ferrari's Felipe Massa that left the Brazilian with a right rear puncture and the McLaren with a damaged front wing. Hamilton, winner here in 2009, fought back superbly to finish fifth as Massa came home in ninth. There were five first-timers in the race and the best of them was Scotland's Paul di Resta, taking his own best F1 finish with a fine sixth place for Force India, who also saw Adrian Sutil in the points in eight position. Between them was Nico Rosberg, whose Mercedes teammate Michael Schumacher gave the crowd its most heart-stopping moment when an attempted passing manoeuvre at Turn 8 saw him climb over the back of Sergio Perez's Sauber and crashed into retirement, fortunately without damage to himself. The mid-race incident brought out the Safety Car for its only appearance of the evening, but Perez was able to continue and collect the final point for 10th place, the Mexican rookie's third scoring finish of the season. Sunday gave the Singapore crowd two other races to enjoy, with Afiq Ikhwan Yazid making it a double for Meritus in the second JK Racing Asia Series 10-lap encounter ahead of Petronas Mofaz driver Nabil Jeffri and Duvashen Padayachee of Eurasia Motorsport. Once again series leader Lucas Auer provided the main talking-point, the Austrian damaging his front wing in his charge to the first corner from 10th on the grid, eventually losing it altogether on lap 8 to prompt the race's second Safety Car period and trailing home ninth and last. Fourteen-year-old Akash Nandy triggered the first Safety Car intervention when he crashed out on the second lap. The second Porsche Carrera Cup Asia 12-lapper saw the same top six finishers as on Saturday, with Christian Menzel completing his own double for Team StarChase ahead of SC Global's Craig Baird and Keita Sawa of LKM Racing. "It was a perfect weekend," said two-time series winner Menzel, guesting this weekend in the absence of 2011 leader Alexandre Imperatori. "The last time I was in this version of the car was in February, but I felt no trouble at all this weekend. Today it might have looked easy, but we had to push very hard. Every time I looked in my mirror there was always pressure and a small mistake and Craig could catch me. I thought to myself: 'I will give you no chance to take the trophy.'" Over at Padang, the main entertainment hub of the 2011 FORMULA 1 SINGTEL SINGAPORE GRAND PRIX, Linkin Park had 50,000 concert-goers all pumped up with the anthem 'In The End', rounding off a perfect weekend at the Grand Prix.